OnePlus 5 Android 8.0 Oreo Update Arriving Soon as OP5 Gets Spotted on Geekbench with Oreo - Playfuldroid! Last year, OnePlus had released Android Nougat update for OnePlus 3 and 3T smartphones before the end of the year. It seems that the Chinese manufacturer is working on Oreo update for OnePlus 5 that will arrive before the end of this year. 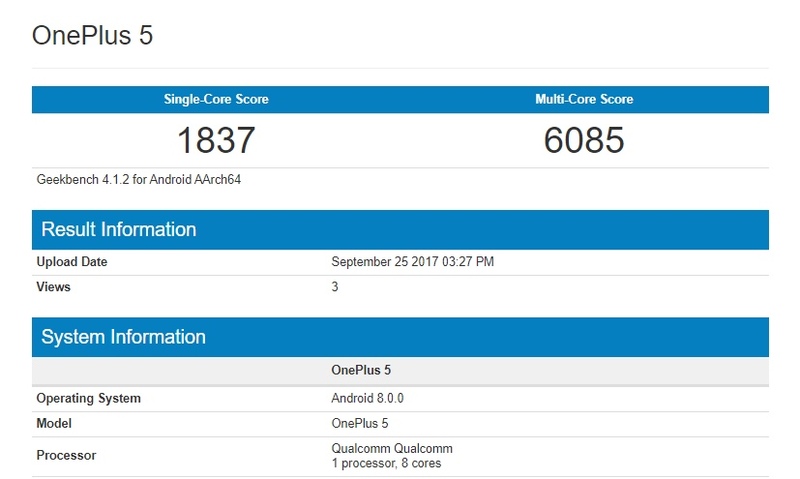 The OnePlus 5 has been spotted on Geekbench benchmarking site with Android 8.0 onboard. The above screenshot shows that the OnePlus 5 is running on Android 8.0.0. OnePlus has confirmed that the OnePlus 3 and 3T smartphones will be receiving the Android O update. The company has already released a closed beta version of Android 8.0 that allows only few number of testers to try the latest Android version. OnePlus is also expected to release closed beta version of Android 8.0 for OnePlus 3T and OnePlus 5 users. Also, the Android 8.0 Oreo update is also expected to bring along the latest version of OxygenOS. As of this writing, there is no information on the exact timeframe on the arrival of Android Oreo update for OnePlus users. However, it appears that all the OnePlus 5, OnePlus 3 and 3T users may receive Android O before the end of 2017.